Welcome to the second day of sneak peeks from Taylored Expressions!! I am lovin these adorable Petite stamp sets combo (with die)!! 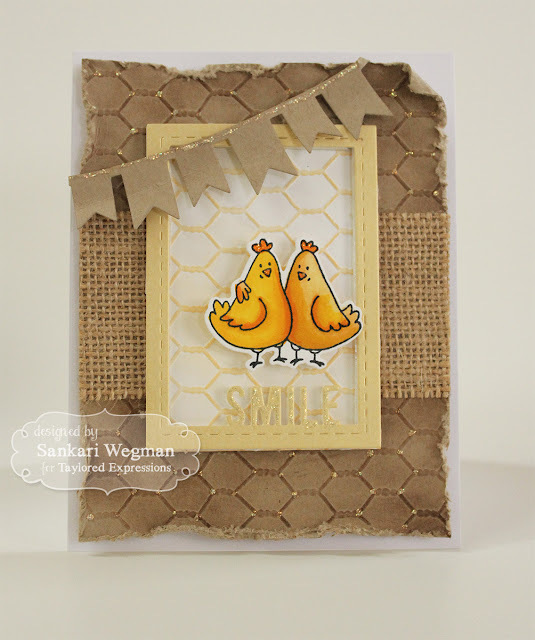 For my first card today, I created this fun card using the Picture Perfect - Smile frame die and paired it with the adorable hens from the Happy Hens Combo small -- aren't these hens so so so cute?!! And the new Chicken Wire embossing folder is seriously just toooooo cute!! 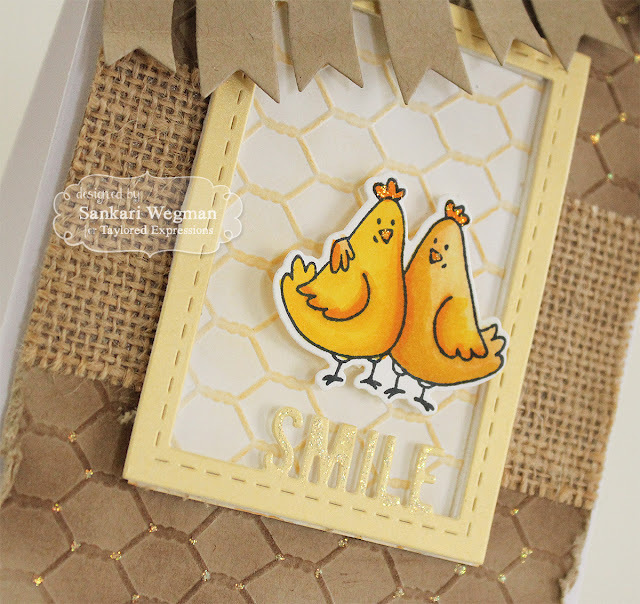 Here is a close up of these cutie hens - I added a little burlap ribbon to the middle and then a little distressing to the edges to make it more.... barnlike? lol! I also added some stickles to this card to give it some barn-chic!! :) Love how this turned out!!! For my second card, I think I made one of my most favorite cards ever! I love how this card turned out!! 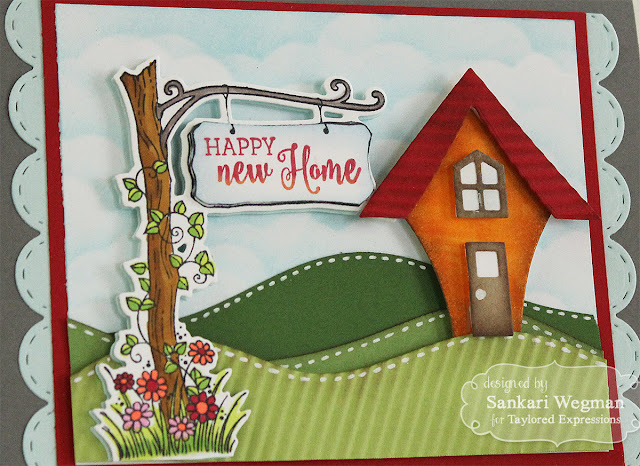 I used the new Sign of the Times stamp combo small stamp set that comes with different sayings you can stamp into the sign and paired it with the Welcome Home stamp set and the Build A House dies. It was so much fun to create a little scene with all of these wonderful Taylored dies paired together! 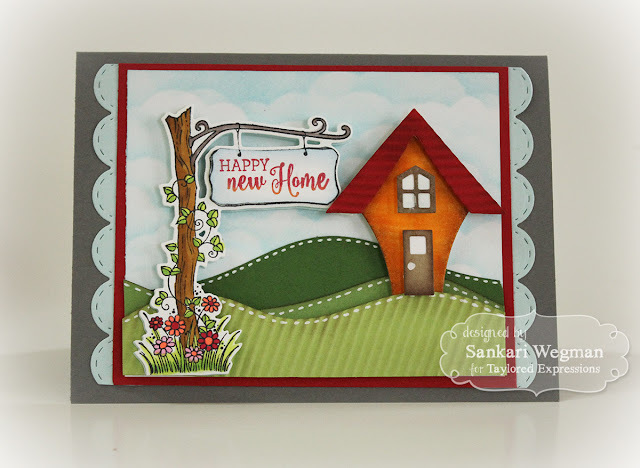 Here is a close up - Love this cute sign and all the vines creeping around it - it was so much fun to make this card and put this house and hills and sign together! Crafting is the best therapy!! Great cards Sankari, the first one is so funny. Love the scene you created with the second one.